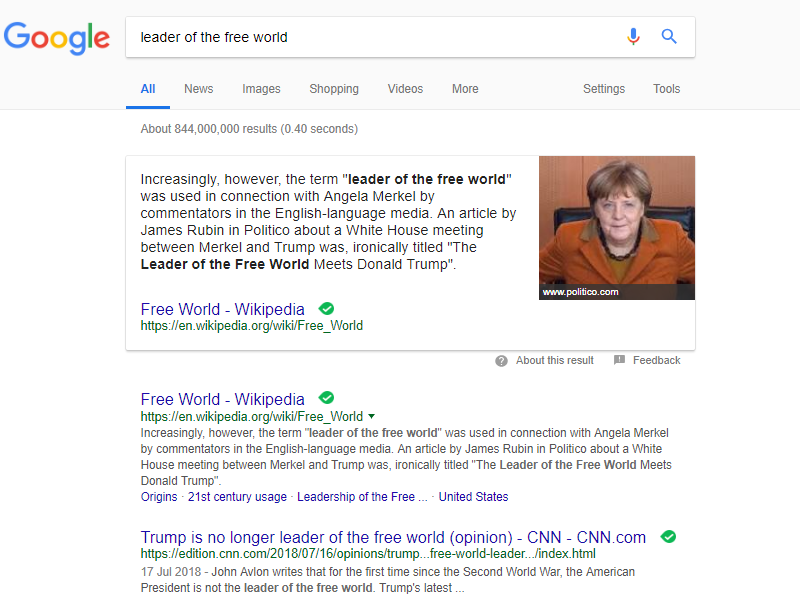 Thanks to its reliance on information from Wikipedia, the top Google search result for “leader of the free world” is not the President of the United States, with whom the term is normally associated, but crisis-engulfed German Chancellor Angela Merkel. The top result scrapes information from Wikipedia, which notes that the English-language establishment media has increasingly used the term “leader of the free world” in connection with Chancellor Merkel. This is true — although it says more about the media’s bias than it does about Merkel, whose long dominance over German politics appears to be on the verge of breakdown. The Wikipedia page also notes that German commentators, as well as a leading member of Merkel’s own political party, have largely disagreed with the western media’s assessment and that Merkel herself has “rejected the idea as absurd.” Strangely, none of that information made it to the Google results.